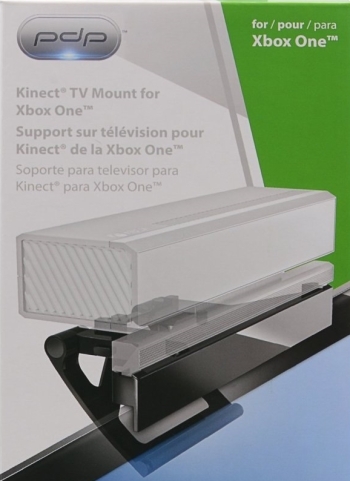 Manufacturer PDP is offering a clip mount for your Xbox One Kinect with a removable cover to protect your privacy. Peripheral manufacturer PDP has made available a television mount for your Xbox One Kinect, complete with a privacy shield. The mount is designed to clip on to flat panel televisions. The privacy shield covers both the RGB and infrared (IR) cameras. PDP also produces an Xbox 360 Kinect mount, though without a privacy shield. The Xbox One version of the mount is available for pre-order from Amazon for $19.99 USD, to be released on December 4. Since its announcement, privacy concerns have surrounded the Kinect. In order to process voice commands to turn on your console, the Kinect must be on even when the Xbox One is off. Microsoft confirmed in May that the Kinect can actually be turned completely off, which is a simpler solution to concerns about the Kinect observing your living room at all hours. Even with the privacy shield on, the Kinect can understand two distinct voices simultaneously, so the shield will only keep the Kinect from picking up video data. The video capabilities of the Kinect are impressive - it can distinguish between players and spectators, detect 25 joints from up to six people, and calculate player heart rates. Concerns have also been raised over the Kinect's ability to measure facial expressions and engagement, which could be used for targeted advertising. Microsoft Director of Product Planning Albert Penello stated on NeoGaf that there is no active work being done on that kind of advertising. Penello adds, "If something like that ever happened, you can be sure it wouldn't happen without the user having control over it. Period." Depending on your living room, a television mount may be a great solution for placing your Kinect. If you are just concerned about privacy from the peripheral, however, maybe just throw a blanket over it? Or, of course, turn it off.